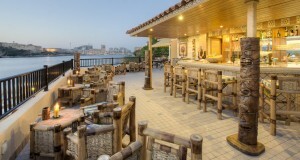 Welcome to Tiki Bar & Restaurant, a stunning venue, right by the water’s edge. Alongside and beyond our large outdoor pool you can find the Tiki Bar & Restaurant. This casual Mediterranean Diner is on the very edge of the shore, giving it truly unobstructed views of the Harbour and Manoel Island. It’s the ideal spot to watch the water sports activities taking place around the city. We are pleased to offer a wide variety of dishes for you to enjoy overlooking the beautiful Marsamxett Harbour. So sit back, relax and enjoy our hospitality. The menu includes a selection of pasta dishes, salads, grills and fresh fish. The theme of the venue reflects a Tiki ambiance, making this a truly unique venue on this side of the Island. The Tiki Restaurant is currently closed and will reopen in Summer 2019. Dinner A La Carte Menu 19.00-23.00hrs. Should you wish to place your booking or require any further information, kindly contact our Food and Beverage Team on fb@excelsior.com.mt or on 21250520. Bookings are recommended. Dates and times are subject to change according to weather conditions.